On the way home from church yesterday, BigGirl compiled a list in her new notebook that she won in Sunday School. "Things I want to do with Mom and Dad today." Well she only really had 1 thing that she wanted to do with Mom and that was to bake cookies. She doesn't even like cookies that much, which makes it even sweeter that she wanted to do that with me. So, after she finished doing about 4 things from her list with Dad (with still 6 left on the list), she made time for me. BigGirl and I made scrumptious sugar cookies. 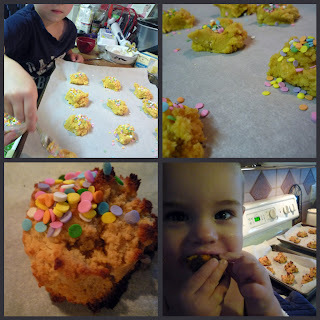 We modified a Chocolate Chip cookie recipe because we are out of chocolate chips and wanted to use our healthy Coconut Flour and rainbow sprinkles. If you haven't tried baking with Coconut Flour, please do. It's gluten free, has lots of fiber and protien, and so light and delicious and good for you. Preheat oven to 375. Mix together butter, sugar, eggs, vanilla and salt. Stir in coconut flour. Drop batter in spoon-sized mounds 1 inch apart on greased cookie sheet. Top each cookie with a small spoonful of sprinkles. Bake at 375 for 14 to 15 minutes. Cool slightly and remove from cookie sheet. Makes about 2 dozen delicious cookies. my weekly menus haven't been very exciting lately. if you want some good menus check out Menu Planning Monday at OrgJunkie.com.